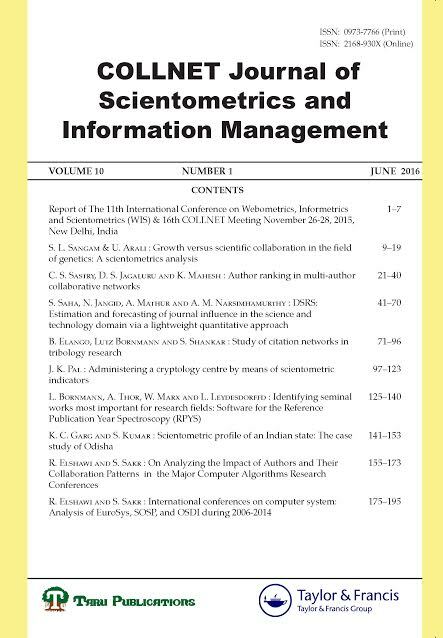 COLLNET Journal of Scientometrics and Information Management is a half yearly publication, aimed at publishing recent research outcome on the subject of Scientometrics and Information Management and bringing it to the notice of the Information Professionals and Researchers the world over. COLLNET is a global interdisciplinary research network under the title “Collaboration in Science and in Technology” (www.COLLNET.de). Prof. Shabahat Husain (India) was its founder Editor from 2007-2010. This journal is also patronized by Society for Library Professinals (SLP), India (www.slp.org.in). The journal is now being co-published with Taylor & Francis Group, UK.